Edward "Eddie" S. Fatu (March 28, 1973 - December 4 2009) was a Samoan professional wrestler best known for working with the WWF/WWE under the ring names Jamal, Ekmo, and Umaga. He worked closely with Matt Anoaʻi of the Anoa'i wrestling family which he was also a part of. With Anoaʻi, they formed the tag teams The Island Boyz, the Samoan Gangstas, and 3-Minute Warning. He also wrestled for All Japan Pro Wrestling and wrestled a short time in TNA Wrestling from 2003 to 2004. Eddie Fatu died on December 4, 2009 of a heart attack. The official cause of his death was from acute toxicity from the combined effects of hydrocodone, carisoprodol, and diazepam. ↑ 1.0 1.1 1.2 1.3 1.4 1.5 "Umaga Bio". SLAM! Sports. Retrieved 2007-07-30. ↑ Waldman, Jon (2009-12-04). "Umaga dead at age 36". SLAM! Sports. Retrieved 2009-12-04. ↑ 3.0 3.1 3.2 "Umaga profile". Online World of Wrestling. Retrieved 2009-02-28. ↑ 4.0 4.1 4.2 4.3 "Umaga Bio". WWE. Retrieved 2007-07-10. ↑ "Wrestler Eki "Umaga" Fatu dies". Retrieved 2009-12-05. 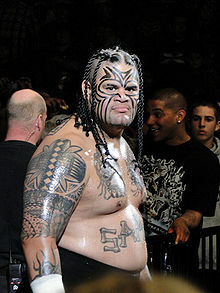 ↑ "WWE News: Eddie "Umaga" Fatu cause of death information released". Retrieved 2012-12-30. ↑ "WWF/WWE Intercontinental Heavyweight Title". Wrestling-Titles. Retrieved 2007-08-04. Wikimedia Commons has media related to Umaga (wrestler).